Being a wedding planner consists of making the customer’s dream a reality. Where as being a bride consists of living that dream. 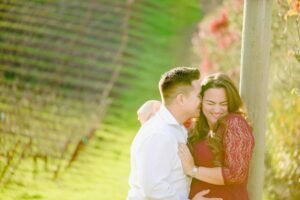 Not many people get to experience being both the planner and the bride, but our very own Jessyca Perez, now Jessyca Canal, has been on both sides of the spectrum. The Canals’ wedding was beautiful, loving, exciting and lively with both a bride’s dream and the event planner’s experience; it was truly unforgettable. Throughout the wedding day, many exquisite and unique ideas were used that will surely become the new trends! Some of these will be featured in today’s blog, and others you will be able to find in future blogs. Weddings usually do not have themes anymore, but do have specific colors allowing the wedding to remain elegant, but with personality. The Canals’ wedding was able to combine the color palette of burgundy, white and greenery with gold accents and an underlying theme of travel and wine! With a couple that has seen the world, it was only fitting to involve this love of adventure on their special day. A hashtag you can follow is #TheAdventuresofDandJ, which has grown and developed, just as their relationship has. Globes and old-fashioned cameras decorated throughout is a way the Canals’ incorporated travel into their wedding. Another unique idea were the place cards and table names attached to a wine cork. Something as simple as this brought life into the room. Table numbers is the traditional route, but the Canals’ had something different in mind! They incorporated travel by naming the tables after some of their favorite travel locations such as Greece, Australia, London, India and Cuba. A custom-made sign that also had these locations could be found right outside the main entrance. This same sign was used at their Engagement Party, Wedding Shower and then of course the Wedding Day itself, tying all the wedding related events together. The cocktail/bar napkins were also custom-made with unique hashtags and personalized facts. Who knew you could learn facts about the bride and groom during the wedding! Women’s Club and the Getting Ready Location at the Biltmore Hotel. When it comes to celebrating, the Canals’ definitely know how to have a good time. As the Canals’ entered the reception, the party began. With confetti cannons being released, a true picture opportunity was created and captured by Organic Moments Photography. Along with the traditional route of reception, the Canals’ really went all out with the reception and the party was full on with everyone dancing the night away! The fun continues with a traditional Colombian band, Vallenato Band, representing the groom’s culture including traditional hats for the guests to wear. But wait, there’s more! If you needed to quench your thirst, there was plenty of that. Not only was there an open bar that lasted 8 hours, they had the unique experience of having a Shot Hour! Shot girls would walk around with Jell-O Shots, Test Tube shots and Cafecitio (Cuban Coffee) shots! This amazing idea was originated by the bride and was a true party favorite. After throwing back a few, the guests had plenty of time to enjoy an encore edition of the Colombian band showing off their musical talents by playing modern tunes. Although you would think that the party was over, the reception closed with “Hora Loca” which had guests participating more than ever. With confetti canons, light up/glow sticks and masks, it was an explosion of color that filled the night. The fun and celebration is something both the Canals’ and their guests will not soon forget. On behalf of the Events by Jess team, we wish the Canals’ all the happiness and love! Congratulations to our favorite wedding planner and bride.